As this site grows, I will be updating this site map or index to better enable you to move around to the section you want. Or, just fill out the search box in the upper right hand corner of the page to get to something specific. This particular index is always going to be slightly outdated as new material hits the site pretty regularly, but my little index keeper upper is on strike and doesn't like creating on the new links. What's here however, will give you a good idea of the subject matter and range of topics within the site. Also, near the bottom is a link to my online gallery where you will find a number of my paintings and where you can find them in real brick and mortar Galleries, or through my online sales pages. Oil Painting Techniques that are Easy, Simple, FUN! This is the main Home Page. From here you start your journey! Learn these oil painting techniques, and enjoy a lifetime of creative freedom! Our main painting lessons! A step by step process that makes oil painting easy. Crazy Easy Free art lessons in How to oil paint! Showing you the classical method of 7 layer painting. A listing of what I use to make a painting! Your first stop in preparing your canvas's in this technique. Stretching the canvas onto stretcher bars. How to prepare a Masonite board or canvas for this style of painting technique by applying a gesso mixture. Composition the is quick to get right the first time. The Ancient Greeks used this formula! Imprimatur, the first layer in oil painting techniques. Imprimatur, This is your 1st painting layer as described in the oil painting techniques. Umber under layer, the 2nd and 3rd layer in the the classical oil painting technique. The 4th layer of the classical painting technique. Where I spend my most time on a piece. The 5th and 6th layer. This is your final 7th finishing-layer in our classical oil painting lessons. Crazy, Easy learn to draw step by step! You will learn to draw and compose in these step by step how to draw lessons! Here you will learn an Ancient Greek Tip to verify your composition is right the first time, and every time! Simple, learn to draw techniques and exercises. Complex-drawing exercises and more learning to draw tips. More lessons and tips on techniques and practices of the professional artist. This is a section, a few more tips ranging across a broad spectrum of subjects. An Oil Painting lesson on copying famous paintings of the masters and your own pieces! See here several examples of works copied and what you will learn from practicing the technique. An Oil Painting lesson on form and modeling, what all realists and representational artists need to learn! See here several examples of actual objects and what is done to make them appear 3 dimensional. A whole new section on Color Mixing, Color Theory, and Color Psychology. No more making mud! Check these great pages out and brighten your paintings up with these great tips, and lessons. Some really great tips on painting that formal bouquet or just that wonderful daffodil you just picked from the garden. I have a whole section on Roses that is growing! Gosh they are beautiful flowers. Learn how to draw them, paint them, grow them, and some history to boot! Paintings in progress, as I discuss some of my problems and how I go about fixing them. Oil Painting Lessons from my EASEL! 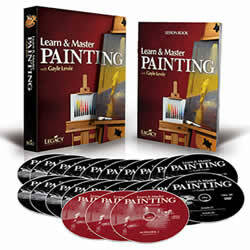 I also have links to dozens of painting demonstration from here. Art Career News, Art Business, Art Marketing, and Artist Promotion techniques with other musing's that come to mind about the business of art, and what it takes for you to become a better artist outside the studio. Art Musings, how to crash through the blank canvas! Going beyond just flowers and fruit! 6 ideas on selecting still life subject matter. Choosing a digital camera for the artist is not that difficult! Which digital camera features for the artist are necessary. Part 2 on the subject. Photography lessons on how to shoot your own art work for advertising, brochures and prints. Squaring up your Fine Art Photo and getting that professional looking shot. The Mind Map a simple yet powerful tool in organizing any project, especially designed for the artist. Time Management Techniques for the artist! two powerful tools in scheduling your time for your art! A launching point for several interesting articles on Modern art, classical art, and a 4 part series on Leonardo Da Vinci paintings and the real facts surrounding the pieces in uncovering "the Code". A four part report on the real facts surrounding several on Leonardo's most famous works, 2 of the worlds most famous paintings! And if you live in the U.S., where you can actually view the only Da Vinci painting in America! Start your investigation here. A discussion about understanding this genre of art. Art Politics and the role it plays in todays Art. A discussion about how politics played an important role in the creation of one of our greatest art movements. Art Articles on oil painting and oil painting instructions. A full listing of articles on materials, ancient re-discovered techniques, a little history, a 7 reasons why you should oil paint! How to keep you paintings bright, and keeping mud out of your color mixes. Why police usually wear blue, why the Golden Arches are yellow, and a few more! With all the home decorating idea's out there, where do you start? You'll find a quick and easy step-by-step guide on how to narrow down your choices. Art Marketing 101, I explain it all in this series of articles. If you're just starting out in the art field, this is a must read before taking that big leap! OK, so you think you're an artist? Check this out, just to be sure! Breaking it down to see exactly what you need to start. Finding your artistic Voice, your artistic style. Modern, abstract, realistic, flowers, landscapes, still-life's. How to decide! Your presentation package, what is it? I show you what it is, and what it aien't, then how to improve it! It's not like a regular resume, that's for sure! The artist statement, every gallery will need it. And I show you some super tips on how to create your own! How to find 'em, how to get 'em to show your art! Just like the name implies, no sheep allowed! Other venues to sell art. And you thought you where stuck with Galleries? Beyond your paintings, prints, cards, publishing. 4 great tips on how to expand your horizons! Some advice on where to start this process. A new page that offers shopping. Presently I have but some of my giclee prints here, but more neat stuff is coming! This page is about me, how I got started in Art, and the neat program that helped me create this awesome website! Your oil paintings, photo's, stories. This page is about you, how you created that masterpiece, the story behind the art work, and your favorite pieces! Come on and join the fun! Contribute and share your ART! You can use these photos for your next painting and, contribute so others can paint your pictures! Have a cool artistic website? Do you have some great information on your blog? If it's a benefit to most of my readers, fill in the form and we will trade links! The Easy Oil Painting Techniques Sitemap is an Index that lists at a glance the contents of the Easy Oil Painting Techniques website, grouped by subject matter for your convenience. Click here to see more of my paintings!